Human activities threaten thousands of species with extinction. However, it remains difficult to predict extinction risk for many vulnerable species. Species characteristics and phylogenetic relationships can help predict responses to global change and likelihood of extinction. Historical data on species losses can allow for testing phylogenetic patterns in extinctions and identifying traits that influence species vulnerability to local extinction. We use historical botanical data from Kalamazoo County, Michigan, to examine whether species characteristics or phylogenetic relatedness explain species loss at the county level. Prairie species, species at the edge of their native range, regionally rare species, and habitat specialists were most likely to become locally extinct. Prairie species experienced the highest extinction rates of any habitat type, and among prairie species, regionally rare and specialist species were most vulnerable to loss. Our study demonstrates how using herbarium records can serve as a call for monitoring biodiversity loss and habitat restoration. Meredith Zettlemoyer is a PhD Candidate at Michigan State University's Kellogg Biological Station. She earned her BA in Biology and English from the University of Virginia, and worked with AmeriCorps as a park naturalist and with the Southern Environmental Law Center before joining Dr. Jen Lau's' lab. 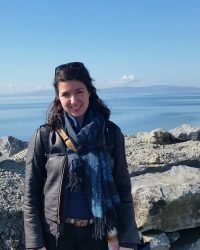 Meredith studies biodiversity loss in response to global change, with a focus on using population models and species traits to to help predict extinction risk.